At long last Mojang think Scrolls is ready to step out of beta and into the harsh light of 1.0. They’ve announced Scrolls’ release date is set for 11 December. 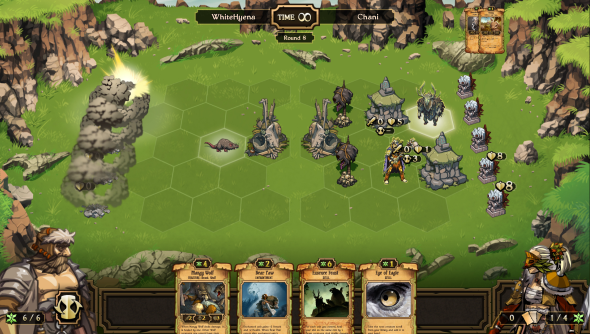 The collectible card game’s been in beta for more than a year, originally releasing on 3 June, 2013. Regular patches and updates have tweaked the cards, you can now play drafts against other players, and you can craft shiny cards, too. There’s also been a significant balancing patch which has tweaked the values of 28 cards. When Scrolls launches next week there’ll be over 350 different cards to collect, each of which can be put into a deck and used in battles against other players. The beauty of CCGs is finding cards that combine well. For instance, one scroll might summon a weak unit to the battlefield which on its own won’t offer much of a fight, but when combined with a card which duplicates weak units, you can use it to overwhelm your opponent. This wealth of cards means you’ll have a stack of units, spells, enchantments, and structures to experiment with. You need to earn gold to get new cards – either buying them from other players or from the Scrolls store. Gold’s rewarded from playing matches and earning achievements, and Mojang say that every card is available with this in-game gold. If you’ve been taking part in the alpha or beta tests then you’ll have access to a version on all the release formats at no extra cost. If you’re a new player you’ll be able to pick up a copy of Scrolls from Mojang’s store for $5. Scrolls saw 28 of its cards tweaked in a recent patch, you can read through the details on the next page. Read on for the full list of changes. Healing a unit now removes any poison effects on it. Bombard (Energy): Now has an Inferno Blast-like area. Machinated (Energy): Now doubles base Countdown of enchanted unit (used to give +1). Gravelock Elder (Energy): No longer gives +1 Attack to other Gravelocks (still gives +1 Health). Gravelock Burrows (Energy): Reworked: Linger 4. When a Gravelock you control is dealt damage, your other Gravelocks get +1 Attack until end of your turn. Effigy of the Queen (Order): No longer has Ward. Pilgrim’s Feet (Order): No longer gives Magic resistance. Vengeance Veil (Order): Now decreases Countdown by 2 (was 1). Grounds of the Fallen (Order): Now only affects Humans. Fields of Strife (Order): Linger 4 (was 3). Caravans of the Expanse (Order): Linger 5 (was 4). Banner of Ordinance (Order): Reworked: 0/1/3. Ability: When Countdown is 0, you may sacrifice Banner of Ordinance to destroy all Lingering spells and heal adjacent units by 1. Bloodline Taint (Decay): Cost 2 (was 4), Curse 1 (was 2). Cursed Presence (Decay): Curse 3 (was 4). Return to Nature (Decay): Cost 3 (was 2), no longer has Taxing. Forbidden Ruins (Decay): Linger 5 (was 3). Invocation Sentry (Decay): When a Lingering spell is played, a random opponent idol is dealt 2 damage. Festering Freak (Decay): 2 Attack (was 1), 3 Health (was 2). Brain Lice (Decay): Cost 3 (was 4). Pest Dissimulator (Decay): Cost 4 (was 5). Soul Scrounger (Decay): Cost 2 (was 3). Anima Conduit (Decay): 4 Health (was 3). Elan Vital (Growth): No longer gives Magic resistance. Illthorn (Growth): 4 Health (was 3). Vitriol Aura (Growth): Reworked: When enchanted creature deals damage to another creature, that creature becomes poisoned. Seed of Insurgency (Growth): Cost 4 (was 5). Junkyard (Growth): Now gives +1 Attack and +1 Health to Rats (used to only give Health). Clandestine Orchard (Growth): Linger 5 (was 4). Fjords of Vigor (Growth): Reworked: Cost 2. Linger 4. Units you control costing 3 or less have +1 Attack. Order’s Ducal units have new artwork. The AI now understands Halls of Oum Lasa. The second player is now shown their hand immediately when the game starts. Fixes to the new tutorials. There you have it. Have fun!